The Flying 15 was designed by Uffa Fox in 1947 and the first hulls built at his Cowes based boatyard. Uffa recounts in his 1959 book, "Sailing Boats" that Jimmy Damant, a Commodore of the Island SC and one of the earliest owners of the International 14, had often encouraged him to; "Design a boat like the 14-footer, but at least 18ft long, that will not capsize. Then you would have a sensible, safe boat, that was fun to sail as well, for the rough and tumble of tidal waters like the Solent." With over 4000 flying fifteens built to date (a large proportion of these are still sailing some where in the world) it is the most popular small keelboat in the world. We also encourage competition in older boats and have a very active classic division (for sail numbers 2700 and below) and a silver fleet division (for sail numbers between 2701 and 3400). 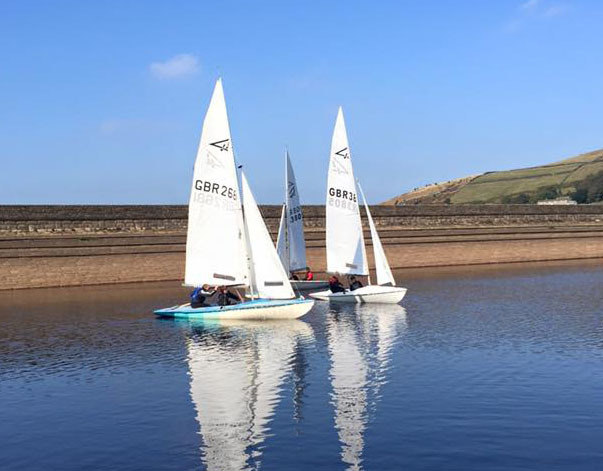 With boats remaining competitive for many years entry to the class can be at a reasonable price point, with new prizes being offered for new comers and the youth element of our fleet.